Store your white garments away from the light – During the manufacturing process, fabrics are bleached and treated with brighteners or fluorescent dyes to create the optical illusion of whiteness. Long exposures to light can break down these fluorescent dyes, causing areas to be discolored or stained. Unfortunately, this is an irreversible problem. Never let a stain set or oxidize – The last thing you want to do is let you white garment get very dirty and allow the stains to set. These conditions make it extremely difficult for us to restore it to its original state. Because of the delicacy of the white dyes, it is important to bring your untouched, untreated, stained whites into us as soon as possible. Anton’s will handle your items with the proper professional care that they deserve. Store your white items separately – Did you know that storing your whites closely with dark garments, can lead to your white garments to become stained without leaving the closet? This natural process, know as sublimation, is where nitrogen gas causes dark dyes to lift and redeposit on light garments, creating stains. Always take the plastic off – You’ve done the right thing by having your whites professionally cleaned, but please take off plastic covering before storing them away! Plastic bags will trap the humidity and gases around the garment, causing them to yellow. We certainly don’t want that! What should I know about storing my clothes for the season? A. Be sure clothes are clean before putting them away. Invisible stains, such as coffee and soft drinks, can oxidize over time and appear as yellow. The longer the stain sets, the more difficult it is to remove. Insects such as moths, crickets and silverfish also love to feast on food, perfume, body oil and perspiration stains doing irreparable damage to the fabric. Store in a dry, well ventilated area. Temperature swings can cause moisture to form in clothing and create mildew problems. Don’t store clothes in the poly bags from the drycleaner. Over time, these bags can promote moisture. They should be removed when you bring your clothes home from the drycleaner, but keep the paper dust covers on the shoulders for protection. Avoid direct exposure to sunlight or artificial light that can cause fading. Remember to turn off closet lights. When possible, store dark and light colors separately. This helps prevent the dye sublimation or transfer. 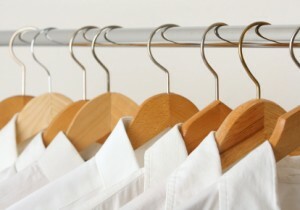 Store coats on heavy, sturdy hangers, not on coat hooks or wire hangers. Store sweaters and knits folded and flat to prevent stretching and distortion and do not store in plastic bags so the natural fibers can breathe. If you have cedar chests or closets in your home, renew the cedar every few years. Cedar must be re-sanded or fresh cedar oil applied to retain its effectiveness. If you don’t have an appropriate place for storing clothing, consider trying our Anton’s Closet where your clothes are placed in a temperature-controlled facility. You pay only for the cleaning and your items are safely stored for the season. Just call about a week before you want to pick them up so we can press them. Click here for more information.